Yamaha has had great success in getting Indian customers to invest more in their motorcycles. First came the R15, a bike that got people thinking it was okay to spend over Rs 1 lakh on a 150cc motorcycle. Soon after, the FZ16 convinced buyers that you could pay more for design, engineering and quality even if you didn't have segment-leading specs. 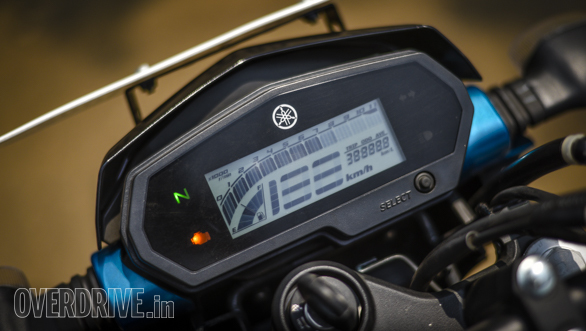 Today, the FZ16 nearly touches Rs 1 lakh on-road. It isn't the quickest motorcycle in its segment either, but it sells in far higher numbers than many of its rivals. The reason? Great quality, an unstressed ownership experience, and a fun yet comfortable and practical experience. 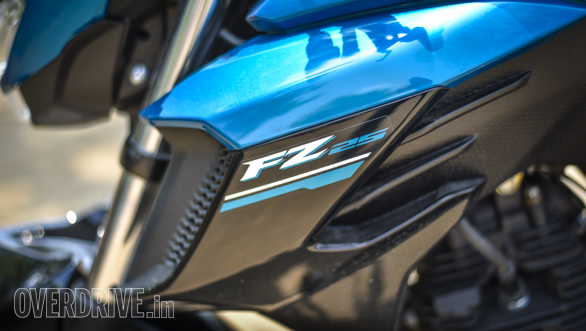 The FZ25, like we said in the first ride review, offers an amplified version of this winning formula. After having spent a few days with it on Mumbai roads, it's quite clear, this is exactly the upgrade the typical FZ16 owner will appreciate. The style is handsome but familiar, and the flavour of performance is similar as well. 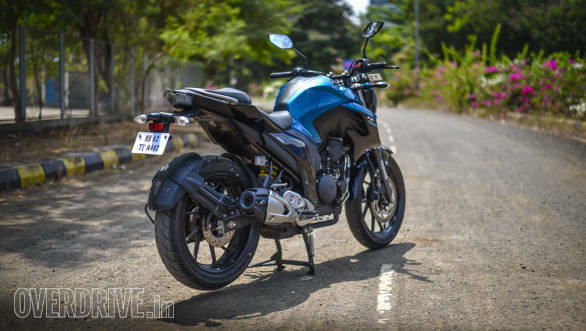 Like with the junior FZ, comparing spec sheets and price charts will do the FZ25 no favours. The proof of the pudding comes in the riding. 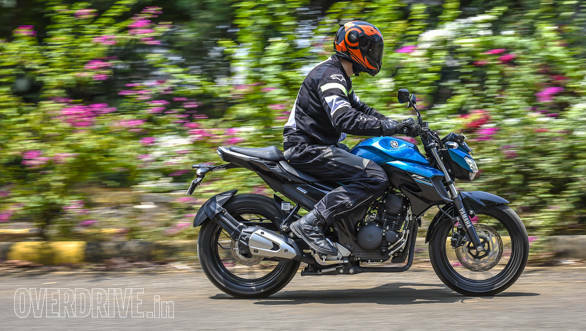 The FZ25's 2-valve, 249cc single is air cooled, but benefits from an oil cooler to produces a decent 20.9PS, which it sends to the rear wheel via a 5-speed gearbox. 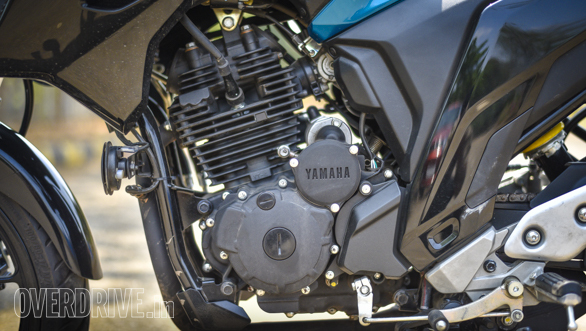 The engine is a tried-and-tested unit from the XT250, a small dual-sport bike. In line with its lineage, the motor has a strong bottom end with wonderful tractability. Feel lazy enough and you almost never have to use first gear in traffic. Pottering around in higher gears comes naturally to this bike, and I often found myself in fifth gear as low as 35kmph. Factor in a fairly light clutch, and an overall feel from the saddle that is almost no larger or heavier than the standard FZ and you have a wonderful city motorcycle. Thanks to the engine's unstressed ability to sit in high gears, city mileage is a decent 30.8kmpl. However, the lack of a sixth gear means that highway speeds have the engine running a bit higher than we'd have liked, resulting in a highway figure just under 40kmpl. Regardless, these are very decent figures for a 250cc motorcycle. All this talk of city tractability and fuel efficiency generally leads to the assumption of average performance. But the FZ25 pulls another rabbit out of the hat. With a brisk 0-100kmph time of 10.2s, the FZ25 is about two seconds quicker than the RTR 200 FI, a bike with very similar specs. 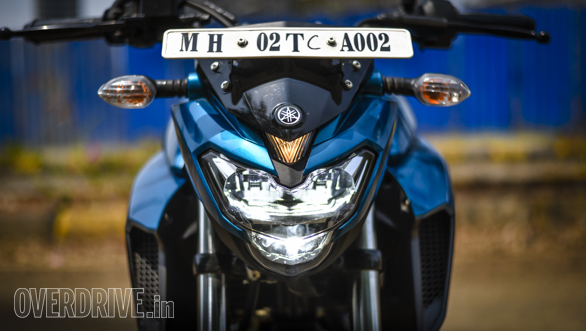 In fact, it brings the FZ within half a second of the time set by the considerably more powerful Bajaj RS200. We didn't have the opportunity to record a run, but top speed should be in the 130-135kmph ball park with the digital speedo edging past 140kmph. At city speeds, the FZ is remarkably refined. 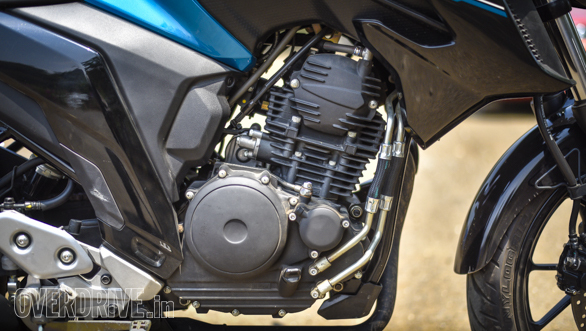 It produces a mildly throaty but restrained exhaust note, similar to the FZ16. Vibrations are managed well. The redline resides at 10,000rpm but there's little point in making a visit thanks to the meaty low and mid range. A 100-105kmph cruise is fairly sustainable in fifth gear, but the bar begins to mildly buzz in protest if you twist the wrist further. The FZ25 is a competent companion on the highway, but you'll find your left foot making the occasional hunt for that extra gear. Part of the FZ25 comforting familiarity comes in the way you are perched on the motorcycle. The flat handlebar ensures the rider sits almost completely upright with the large tank providing a solid point of anchorage. 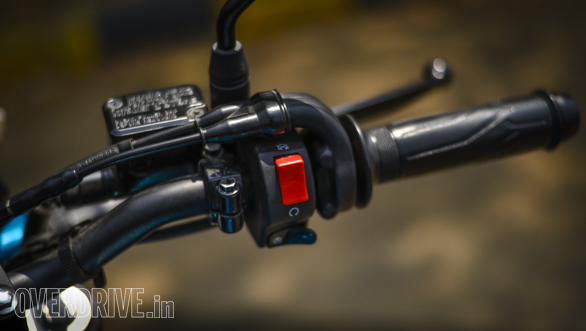 Adding a dash of sportiness, the foot pegs are swept a fair bit rearward, but not with the commitment of something like the KTM Dukes. The riding position does well to balance city comfort with poise for squiggly roads. Shorter riders who find the new Dukes a bit intimidating will feel more at home here, while tall ones like me won't be cramped. 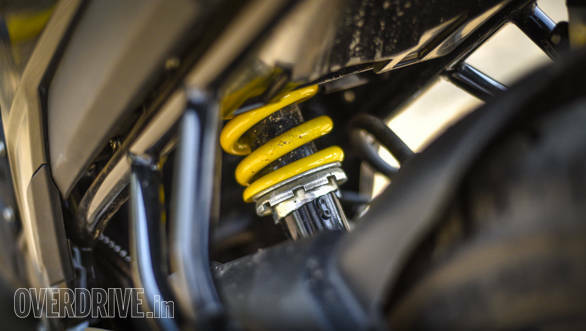 Ride quality has a mild air of firmness through the 41mm forks and mono shock rear. Yet potholes and irregularities are disposed of without undue shock or bother. Once again, if you're familiar with the FZ16, you'll immediately feel at home. The set-up may not be considered plush by the typical buyer, but I don't see it being a bone of contention either. The new, double downtube frame isn't as rigid feeling as the trellis frame on the KTMs, but it's happy to dance with you to the tune of a smooth, winding road. 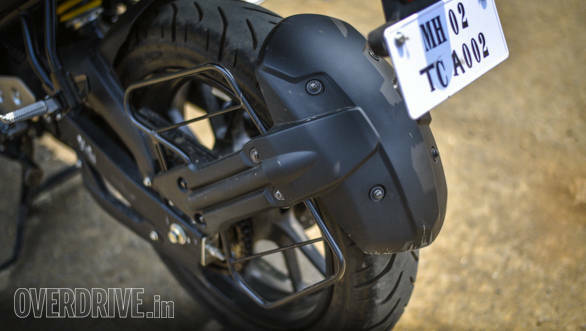 Cornering clearance is generous, better than on the FZ16 and early scraping foot pegs is not a cause for concern. 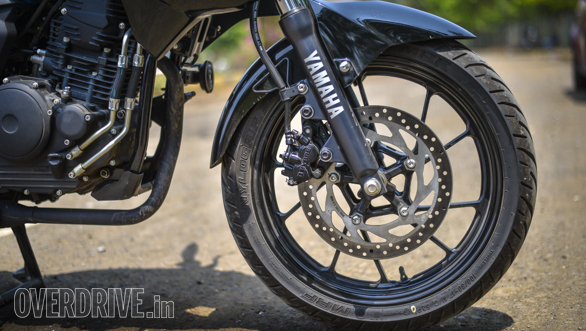 Grip from the MRF tyres is quite good, despite the switch to bias-ply Zappers from the radials on the FZ16. Apparently, customers found the radials a bit too susceptible to punctures on poor roads, hence the change. Braking performance is decently strong and progressive. However, we found in our tests that emergency braking requires all four fingers, as the lever tends to travel towards the bar a little too much. Perhaps this was a one-off on our test bike, so keep an eye out for our updates when we get a long-term unit. Regardless, ABS is sorely missed. At least give us the option! Since we've already discussed style in the first review, I won't go into it deeply. Suffice to say, I like the way this bike looks and am happy with the way it's put-together. The simple digital display is easy to read but a gear position indicator would be nice. 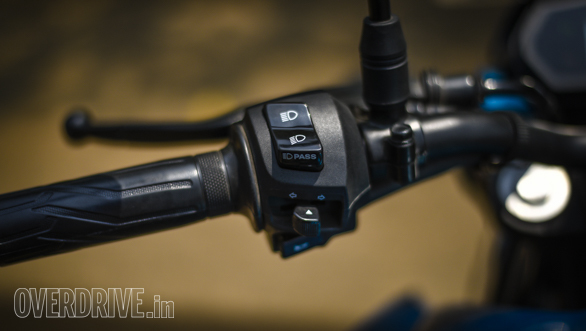 I'm also not a fan of the new thumb operated pass-light switch, a standard finger-trigger is easier to use. 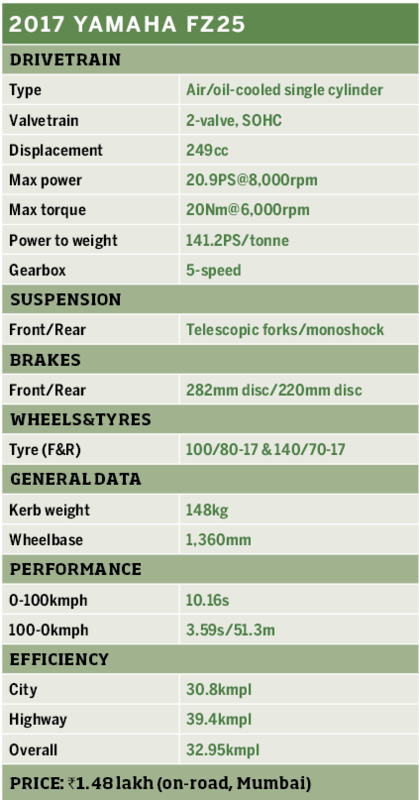 The unit on our bike was a bit sticky as well, often getting stuck on high beam, but I'm willing to consider a one-off on the early test bikes. Again, the long-term report will reveal more! Finally, the full-LED headlamp throws a decently powerful beam of clean white, defined light. It's nicer than a standard halogen, but is nowhere close to miniature sun that resides on the front of the Bajaj Dominar. 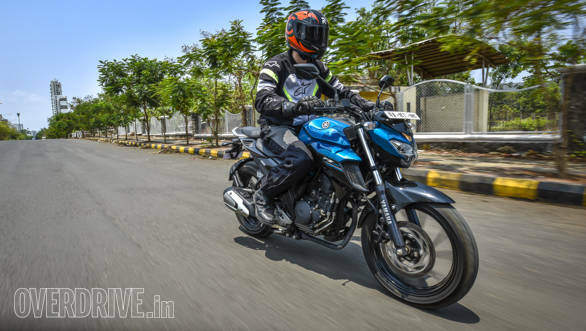 To sum up, the FZ25 is a quick motorcycle that hasn't sacrificed any approachability or friendliness. This motorcycle is no harder to ride than the average 150cc machine. It's comfortable and decently efficient too. It's fair to expect the same levels of quality and reliability we've come to expect from Yamaha over the years. At Rs 1.48 lakh (on-road, Mumbai), the FZ25 sits in a unique location. 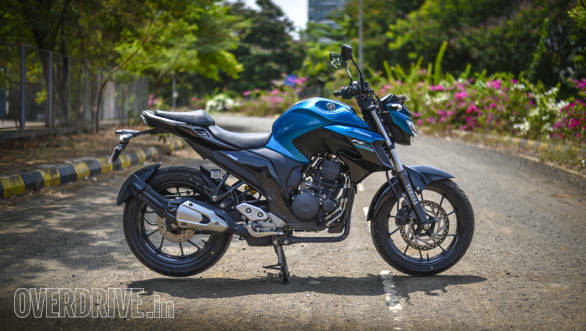 The Bajaj NS 200 is far more affordable at Rs 1.16 lakh. Instead, it's the faired, non-ABS RS200 that is priced on par with the FZ. The base Dominar 400, meanwhile, is nearly Rs 21,000 higher. 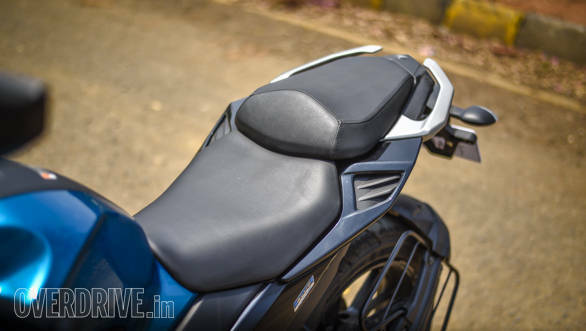 When the RTR 200 FI finally goes on sale, expected in a couple of months (TVS has had large demand for the carb bike for domestic sales and exports), we expect it to be priced at about Rs 1.25 lakh, still significantly more affordable. The FZ25 is expensive, there's no getting around it. But the package is solid and the extra money goes towards the typical Yamaha strong points we've discussed above. It may be gradual, but I see the FZ25 becoming another hit with the customers.